So I'm sure you have all read about the Big Window Challenge competition at Bloomingdale's. 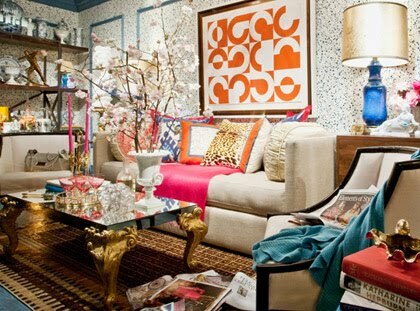 Its a competition between Apartment Therapy, Elle Decor and Bloomingdale's. Well, long story short its a great competition BUT you need to go and vote for Eddie Ross. I really don't need to give a reason, other then I think he is the best and deserves to win- so just go do it- ok? wow- there is so much to take in here and I just love it all! It has a little punch to it and I would like to move in that room...like yesterday. OK, so enough blabbing- go HERE and Vote for Eddie. And do it twice daily till the competition ends. PS- good luck Eddie and Jaithan!! I have not seen this yet, I am so behind on everything! I am going right now, thanks for posting! Aloha :) I just voted for E&J over at AT! The flooring in my bathroom are hand made Moroccan concrete tiles also known as encaustic tiles. (they're actually pretty reasonably priced) Thank you SO much for the super sweet comment!!! Voting now, cannot believe they put this together so fast. Looks fantastic. I had seen the rendering on Eddie's blog- but hadn't seen the finished product. Looks great. I need to get over and vote stat. Their work is amazing...I love what they've done here. Also noting the gold shade over the lamp...I kinda want to add one to my new blue lamp now! Where can we find one Linds?! I love everything about Eddie's except for the wall treatment - a bit too busy for me. But I'm loving that blue lamp! I actually quite like the one by Bloomies - it's more representative of the aesthetic I'd love to achieve in my living room but probably never will!